Includes one year support, updates and upgrades. Free 10-day trialWrite us at sales@terminotix.com to ask for your LogiTerm Pro trial version. CAN$95 for students!Write us at sales@terminotix.com to know how to buy LogiTerm Pro for students. LogiTerm lets translators, terminologists, professional writers and coordinators increase their productivity by at least 30% while improving the quality of their work thanks to a wide range of user-friendly functions that are perfectly tailored to actual industry needs—starting with its search interface. With LogiTerm, you’ll find everything you need: Terminology, Bitexts and Full Text databases, not to mention instant access to 40 of the world’s most popular terminology sources. Once you have launched a search in one database, you can repeat the search in another database with a single click. Don’t waste any more time cutting and pasting search terms and continuously toggling between windows. 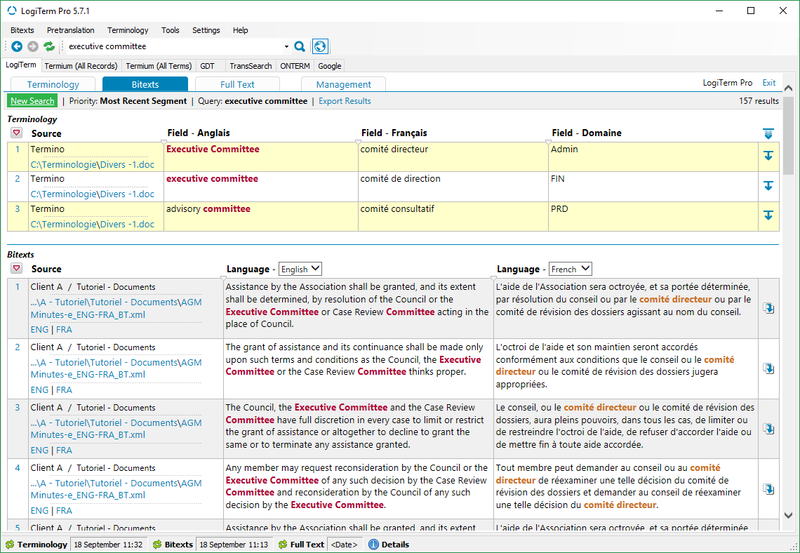 The Full Text database alone gives LogiTerm a huge advantage over other computer-assisted translation tools. It’s your own personal Google, allowing you to search through all your documents, no matter the format (Word, Excel, PowerPoint, PDF, HTML, XML, etc.). Its two filtering levels allow you to index only documents that are most useful to you, based on your preset criteria. LogiTerm’s alignment function allows you to create your own bitexts, which you can then index in LogiTerm and use to pretranslate documents. The program can process over 100 file formats, including PDF. Has a multilingual website caught your eye? Save and align web pages from the site, then immediately use the resulting bitexts for pretranslation. When working with LogiTerm, MS Word is always the translation environment, no matter what type of file you’re translating. For example, LogiTerm allows you to translate PowerPoint and Excel documents in MS Word, then automatically insert the translation back into the original document with the Reinsert Translation tool. The original document format is always retained. Because LogiTerm doesn’t use proprietary file formats, you can always send pretranslated documents to external collaborators who don’t have LogiTerm. All they will need to translate the document is the LogiTerm Toolbar in MS Word. Pretranslated LogiTerm documents are always accompanied by an XML file containing project-specific terminology matches and segments from your databases. Your collaborators can use this XML file as a translation memory as they work on the document. Project analysisThis pretranslation option launches several different functions at once. It allows you to find out the total word count for a project, extract repeated terms that aren’t yet in your terminology records, generate a document listing sentences that are repeated within a project, and learn the most efficient order in which to translate a set of documents. This feature makes it easy to translate repetitions consistently throughout your project. Terminology databaseLogiTerm terminology records are stored in MS Word files, making it easy to modify term data in batches and share records with non-LogiTerm users. Translation spottingWhen you search for a term in the Bitexts database, LogiTerm will highlight its target-language equivalent in the search results. DeformattingConvert any file format into plain text. You can also merge multiple documents to create a single file. Did a client send you a file format you don’t have the software to open? Deformat it! Data conversionImport/export translation memories in TMX or bitext format and import/export glossaries from Excel, MS Word and more. LogiTerm ToolbarThe LogiTerm Toolbar can be purchased separately and is easy to install in MS Word. It allows external collaborators who don’t have LogiTerm Pro to access your bitext and terminology matches when pretranslating documents that you have preprocessed with LogiTerm. Request managementThe single-user version of BridgeTerm Pro translation request management software can be integrated with LogiTerm Pro. Supported file formatsLogiTerm is compatible with over 100 file types, including PDF, Word, Excel, PowerPoint, HTML and XML. Supported languagesLogiTerm supports any language covered by the Unicode standard. InstallationLogiTerm Pro is the single-user version of LogiTerm Web. This means that it is installed on the translator’s computer, rather than a server.